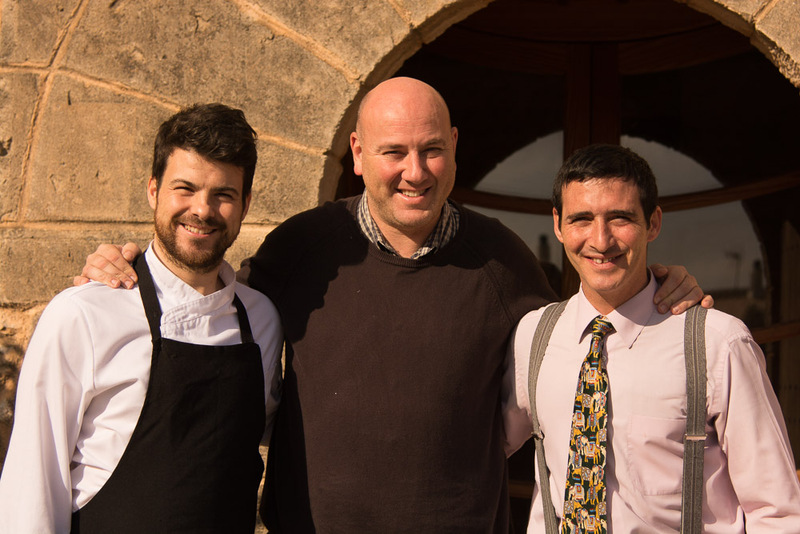 L-R: Chefs Andrés Benítez and Tomeu Caldentey with Manuel Pérez, outside Taronja Negre, in Sant Llorenc. Earlier this year I wrote a post in which I mentioned that Mallorcan chef Tomeu Caldentey had reopened Taronja Negre in the old mill in the village of Sant Llorenç des Cardassar, near Manacor. We had been fans of Taronja Negre in its original format, when it shared these beautiful premises with the Michelin-starred Es Molí d’en Bou (which is now in the resort of Sa Coma). Taronja Negre reopened over the winter with a new concept – offering dishes designed especially for sharing – and we loved it. Palma here we come . . . This month Tomeu has taken this fun concept to Palma, opening the waterside Taronja Negre Mar in the Club de Mar. The old mill in Sant Llorenç will now open only for private parties – and an excellent venue it is too. Taronja Negre is open daily for lunch and dinner – except Mondays. There is parking in the Club de Mar – a real bonus when Palma is busy in the height of season.